My friend was telling me to read this book called Magickeepeers : The Eternal Hourglass. 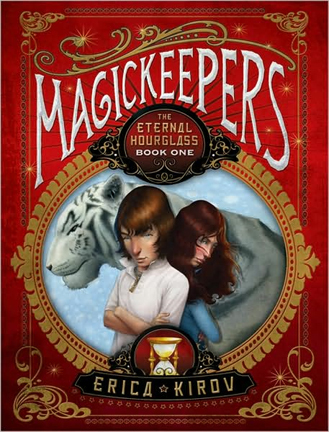 It's the first book in the Magickeepers series. There four books are in the series (so far). In the first book Nicholi (Nick) discovers that he is from a family of Russian magicians and soon is being trained in the art of magic. He meets his cousin Isabella who has a pet Siberian tiger, who will protect her to the death (while he only gets a hedgehog), Damien his other cousin who runs the family's magic show, and Theo who (also happens to be his cousin) is Nick and Isabella's teacher. Nick, whilst trying to handle the fact that he will be in one of the best magic shows in all of the country, figures out that a magical "relic", called the Eternal Hourglass, has gone missing! In this book Nick learns many of things, one of which is that he hates Russian food. I think the characters in this book are very likable. Probably my favorite character in the book is Isabella, she has never lived anywhere besides the family hotel(I find it sad that she's never had pizza before). I bet my second favorite character is Sergei, he is a crazy magic animal seller, who also delivers pizza and Chinese take out through your closet. The book as a whole is very witty and I like the fact that the family magic act is actually magic not mirrors and smoke. This book is full if adventure, humor, and excitement. I hope you enjoy this wonderful book as much as I did!